Is there anything better than a warm bowl of hearty soup on a cold winter day? After having a couple of warmer days, the temperature dropped again and it is freezing cold. So cold that our neighbor’s pipes froze and we’ve had guys with jackhammers and heavy equipment, working between our houses, from dawn to dusk the last couple of days. They got a little overzealous in their drilling and cut through our phone and internet cable, so we are without service until someone can come repair it. In addition to all of that craziness, we’ve had some minor virus going around and we are getting ready for out-of-town guests this weekend. Whew! 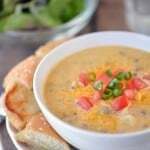 I needed an easy dinner recipe to make for my family, so I made delicious Bacon Cheeseburger Soup! 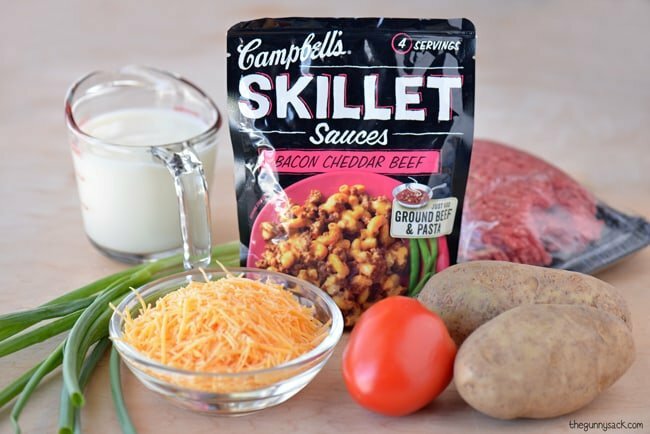 The base of this soup is Bacon Cheddar Beef flavor Campbell’s® Skillet Sauce. Campbell’s Skillets Sauces can be prepared in about 15 minutes. Just cook the meat or seafood, add the sauce and serve it over pasta or rice as part of a delicious dinner! Since my family loves soup, I decided to use the skillet sauce to make soup instead of serving it over pasta. To make this recipe, you will also need ground beef, potatoes, tomato, finely shredded cheddar cheese, green onions, milk and water. First, brown the ground beef. While the meat is cooking, peel the potatoes and cut them into cubes. Put water, milk and the potatoes in a large pot over medium heat. 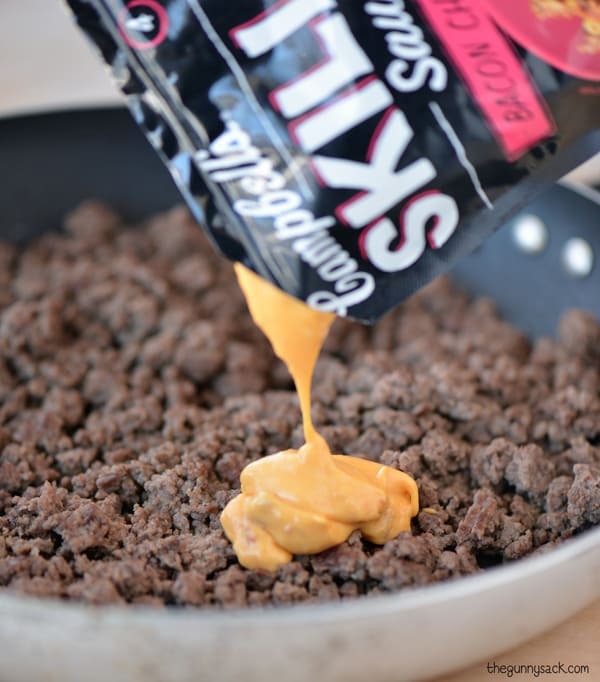 Add the Campbell’s Skillet Sauce to the browned meat and mix well. Pour the mixture into the soup pot and bring it to a boil. Reduce the heat to low and cook for 20-25 minutes, or until the potatoes are tender. While the soup is cooking, dice the tomato and slice the green onions. Then, cut 4-6 hamburger buns in half. 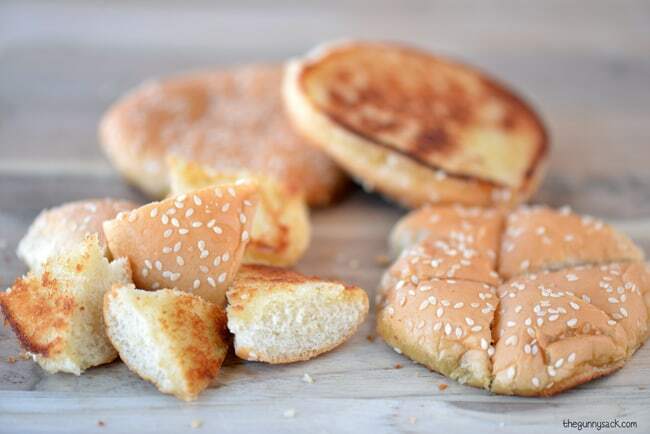 Spread butter on the top half of the buns and toast them in a skillet over medium heat until golden brown. Remove from the pan and cut each one into six wedges. 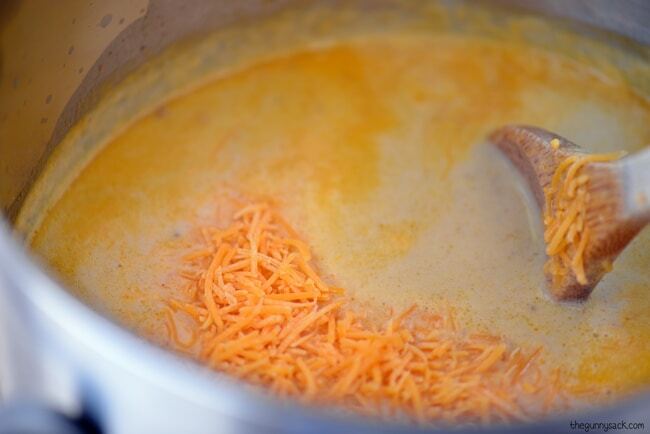 Remove the pot from the heat and stir in shredded cheddar cheese. Ladle the soup into bowls and top it with additional shredded cheddar cheese, diced tomatoes and sliced green onions. Serve with a baby field greens salad and the sesame seed bun wedges. 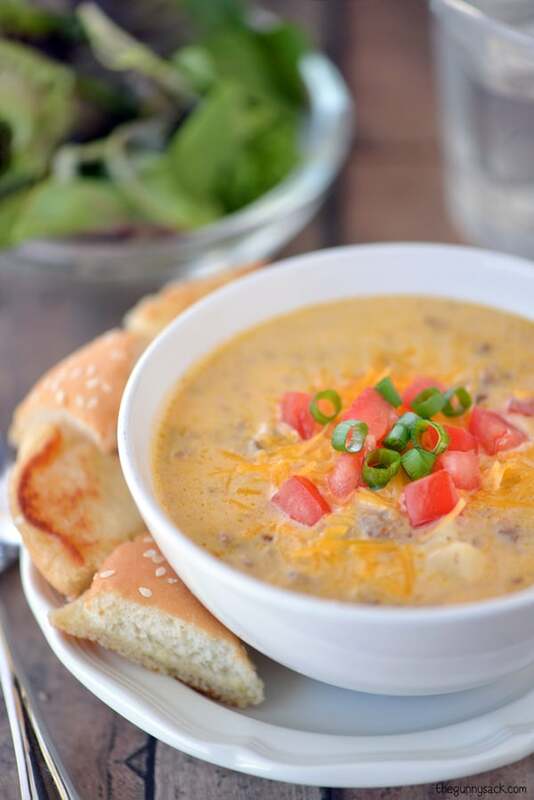 Everyone in my family loves having soup for dinner which is perfect because this Bacon Cheeseburger Soup was easy to make and so delicious! First, brown the ground beef. While the meat is cooking, peel the potatoes and cut them into cubes. Put water, milk and the potatoes in a large pot over medium heat. 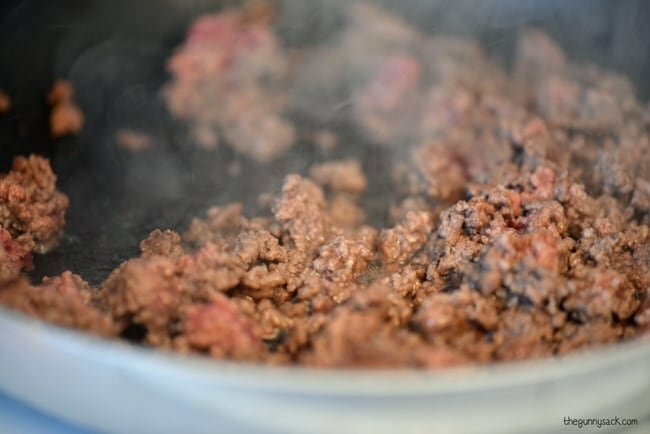 Add the Campbell’s Skillet Sauce to the browned meat and mix well. Pour the mixture into the soup pot and bring it to a boil. Reduce the heat to low and cook for 20-25 minutes, or until the potatoes are tender. While the soup is cooking, dice the tomato and slice the green onions. Then, cut 4-6 hamburger buns in half. Spread butter on the top half of the buns and toast them in a skillet over medium heat until golden brown. Remove from the pan and cut each one into six wedges. Ladle the soup into bowls and top it with additional shredded cheddar cheese, diced tomatoes and sliced green onions. Serve with a baby field greens salad and the sesame seed bun wedges. My husband is not a big fan of soup, but big hearty soups like this are growing on him. This might be our new favorite, I can’t wait to try it! 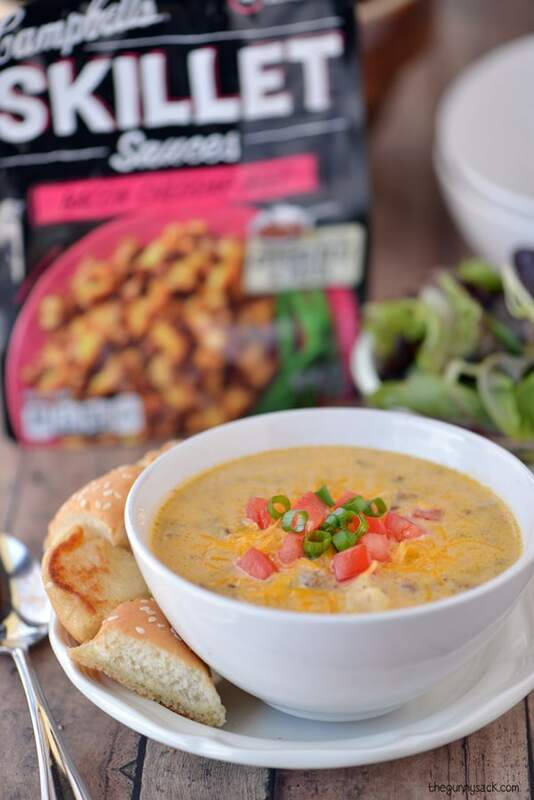 This soup is right up our alley! I LOVE soup in the winter, and you can never go wrong with bacon cheeseburger! This soup looks like the perfect comfort food Tonia! Pinned! This recipe looks SO delicious! I’ll have to make it for dinner soon! I know my husband would love it!